Server virtualization falls within the domain of IT operations but it can very much be a business matter with a measurable impact on the bottom line. Esoteric as it may seem from a business perspective, the server platform, powered by the processor, can make a significant difference in the financial outcome of a virtualization effort. Technological factors such as processing power, memory management and power consumption can translate into tangible business results. 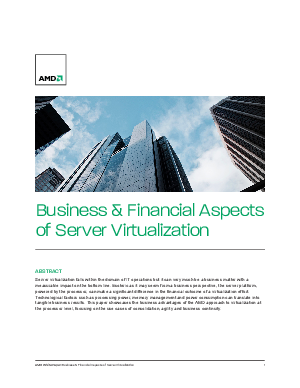 This paper showcases the business advantages of the AMD approach to virtualization at the processor level, focusing on the use cases of consolidation, agility and business continuity.